Kilo Kai Shares its Love! Not to be left in the wake of Kraken and its most excellent promo kit, the fine folks at Kilo Kai have opted to send me gifts in turn. But while Kraken’s goodies were gloriously mythological in nature, Kilo Kai has opted for a more real-world approach (meaning they sent me things that are actually useful.) Yup, as with their rums, these two new titans of the spiced market have taken decidedly different yet equally cool approaches to their promos. 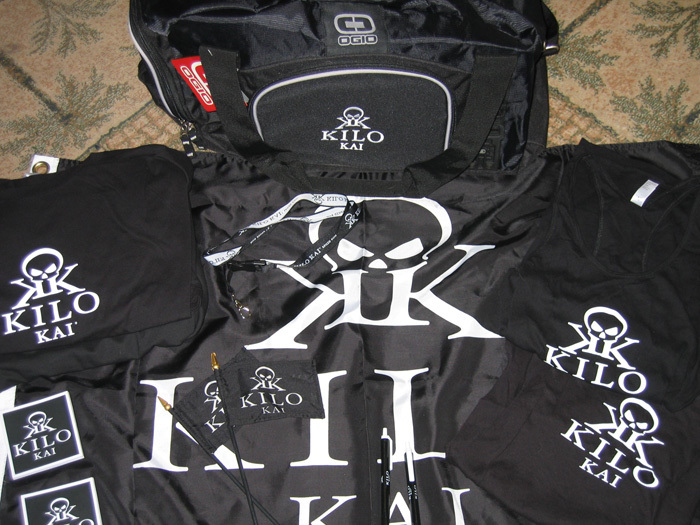 Kilo Kai has provided a fine assortment of shirts, coasters, flags… even a Kilo Kai duffel bag!!! The only thing that makes me sad about Kilo Kai’s goodies is that now I have to make an effort think up a cool way to share the stuff with all of you – I’ll be keeping the large t-shirt for myself, but the 2xl needs a new home. As to the two ladies shirts – my new years resolution involved my no longer wearing girl clothes, so I should probably give them away as well. And I’m thinking even the flags and the entirely awesome duffel bag might need to find their ways into the hands of some lucky pirate (parting with the duffel will pain me, but I love you all that much). 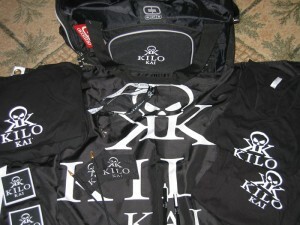 I’m thinking that 3/22/10 episode of Bilgemunky Radio might be unofficially sponsored by Kilo Kai – so don’ t miss it!!! Hey! Don’t be giving away any free stuff on your show until April 12th!